INCREDIBLE LAPPETS ON A NORMANNITES - JURASSIC DORSET. INCREDIBLE LAPPETS ON A NORMANNITES - JURASSIC, DORSET. 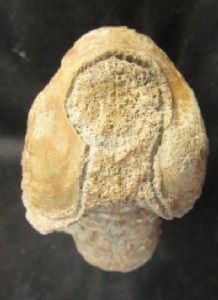 Stephanoceras (Normannites) orbigny S. Buckman. An amazing example of a relatively small Ammonite with a pair of huge lappets at the termination. Such a feature is rarely preserved at all. This is a text book Museum quality piece. The ammonite is developed to the centre one side and the huge lappets dangle down like a pair of cocker spaniel's ears either side of the termination. Incredible ! Oborne Wood, near Sherborne, Dorset. Ammonite : 6.8 cm. diam. Lappets : 3 cm. long.